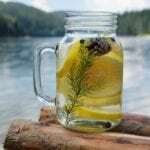 Whether you are a fan of pine needle tea or want a home-based natural business, knowing how to harvest pine needles, and process and store them is part of satisfying either goal. There are many pine needle uses in the landscape as a weed repellent, mulch, soil acidifier, and even to line paths and stabilize soil. Read on for some tips on harvesting pine needles for edible, medicinal or outdoor garden use. Gardeners with pine trees in the yard may consider the debris from dropped needles a nuisance; however, these conifer leaves are actually useful in many different ways. Why should you harvest pine needles? The needles are make excellent fire starters, flavoring for teas and vinegars, grill smoke to season meats, air fresheners, and, of course, mulch. They have many medicinal properties as well. Collecting pine needles and processing them correctly can help you harness any of these natural properties. Pine straw is often sold cleaned and bailed to use in the landscape. Care should be taken when collecting pine needles to keep them free of weeds and debris. Layers of the straw mulch will conserve moisture, enrich soil and help reduce weed growth. They also help enhance the acidity of soil for such plants as hydrangea, azalea, and holly. The scent can also help repel certain insect and animal pests from digging in the garden. Outside of garden use, a tea made from the leaves is not only delicious but the scent can help clear sinuses. Cooled, the tea is used as a cleaner and deodorizer. The needles have antibacterial properties which can help fight certain skin diseases when used as a foot soak. These tree cast-offs are helpful in many household uses. If you plan on making pine mulch, keep the area under the trees free of weeds and other debris. That way when you rake up the needles they will be relatively clean, as the plants shed between August and January. Pine needles break down slowly and can be used as a mulch but also to line paths and don’t need replacing as often as other organic amendments. Leave some of the needles as a bed around the tree roots to help nourish the trees and prevent moisture loss and excessive weeds. Spread out the needles to let them dry if they will be bailed for storage or for sale. For instant use, just move the needles to the location where they will be needed and spread a thick layer. When harvesting pine needles, consider their purpose – not all needles have to come strictly from pines. For teas, it’s best to harvest needles fresh from the tree, and few trees are better than Douglas fir. The needles are high in Vitamin C and make a healing soak for arthritis. Spruce tea is also tasty and can be made into a zingy beer. Redwood needles have antimicrobial properties that may be beneficial when treating colds and flu. Just remember to ascertain whether trees were treated with chemicals and avoid those which were, especially for consumption purposes. If you want pine straw for mulch, the type of tree isn’t as important, but blue spruce needles are very sharp and make barefoot trekking a painful journey. Any pine, however, makes excellent garden amendments.